No, it is not a picture of the new tunics for the Brass Band. It is something quite different. Last weekend on our way home from the course in Norway we stopped in Brussels to visit our old friends Fred-Arne and Sylvia. We have not seen them since we moved to Riga more than two years ago. During our visit we had the opportunity to visit the battle field of Waterloo. That is the place where Napoleon was less succesful some years ago. I found the picture outside the museum. During the past week we have mainly been sitting in negotiations. Negotiations with the welfare department in Riga concerning the future of the Leontine Gorskas orphanage in Riga, which will close in the end of the year, and negotiations about the budgets for next year for the different operations in the Salvation Army in Latvia. This week we had also had prayer 24 hours per day during seven days. I shall just start my shift at five o´clock. 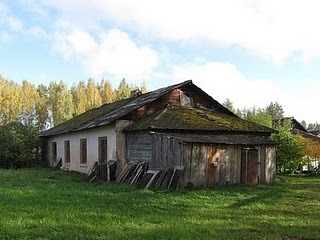 Now it is Monday morning and we shall drive to the outpost Drusti in the northeastern part of Latvia. In Drusti we will have a Soldiers´enrolment of four new soldiers. We will bring the flag for the enrolment, two boxes of new Songbooks (the old ones are worn out by all singing for many years) and a box with the new plastic bags with the Salvation Army shield which will be used for the food parcel distribution the coming winter. To the right you see the Commanding Officer in Drusti. Nicolaj Vollburg who recently turned 42, has a solid classical music education from the Malmö Academy of Music behind him. He studied at the Academy for five years and was a fellow student with Daniel Viklund, and they are once again classmates. 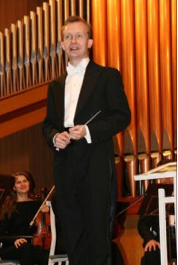 “Directly following graduation from college, I began freelancing as a concert pianist and conductor”, says Nicolai, and says that “there were many trips within Sweden and beyond. - You have to build a network if you are a freelancer”, says Nicolai, who adds that he is Sweden Director of Crescendo, a network of classically trained Christian musicians. “Actually, I have lived with a pastor's vocation for many years, a vocation which I suppressed, but now, God spoke in 2008 directly to me and my family. The message was clear that we would move to the Mälardalen region of Sweden. 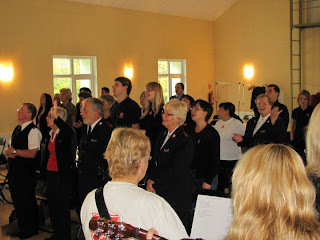 There, I thought about continuing my music career, but God spoke again to us, and I realized that it was in the Salvation Army, that I would serve and that my calling was specifically, to proclaim salvation as an officer. Baptist Press - "A major seven-year study published in a mainstream journal is challenging the secular notion that gays and lesbians cannot change their sexual orientation." Plilcooke.com - "In the early decades of the 20th century – for the most part – the church dropped the ball. Secular philosophy, spiritual anemia, poor leadership, locked-in traditions, and more were keeping the church from making a real impact in the culture. In some cases, local churches farmed out the work of the Great Commission to their respective denominations, but even many of those efforts were poorly executed. Seeing that impotence, a generation of entrepreneurial thinkers moved outside the Church to accomplish what the church wouldn’t do." Christian Post - "Though a country whose First Amendment mandates the freedom of religious practice, the United States of America appears to be suffering from rising religious discrimination in the workplace.According to statistics compiled by the Equal Employment Opportunity Commission, religious discrimination incidents have doubled over the past 13 years." Wesleyan life - "Most of the things that sap my time and energy as a pastor—or in any aspect of life—are things I can't do by try anyway. I don't mean dreams that are too big or goals that are too challenging. Those represent things I might accomplish if I work diligently and God blesses the effort. I'm referring to things that nobody can do—they simply cannot be done. How often have you wasted time, burned energy, or lost sleep on one of these fruitless activities?" THE results of the All the World Photographic Competition 2011 have been revealed. The winning entry has an appropriately international twist, being a photo of The Salvation Army in Pakistan taken by an American who currently lives in Korea! Now I am on my way back to Riga after a week in Norway and the NLDI-conference (Nordic Leadership Development Institute). It has been an interesting week together with a great group of people. Now it is time for a new week. On Tuesday we will have a gathering for all our leaders in Latvia, looking at visions and dreams sent in from last Leader´s gathering. That will be interesting. Christiannity Today Leadership - "There’s an idea floating around Christian women’s circles. I’m hearing it more frequently. I’ve heard it from missionary colleagues and women at church. I’ve read it in books and seen it posted in comments on blogs. It goes something like this: If God has gifted and called a woman to lead, teach, pastor, or preach then he will make a way for her to fulfill that calling." Charisma Magazine - "My husband, Steve, and I once owned property that had an eagle’s nest on it. One day after a spring storm we went out to check on the property and found that a third of the nest had been blown down. As I looked at the fallen pieces, it occurred to me that often when we think of eagles we picture the majestic bird that is our national symbol—a bird that is able to soar high above any tempest that might come along. We rarely think of eagles as having to go through storms." The Christian Post - "The debate on whether Mormon presidential candidate Mitt Romney can be called a Christian carries on with the pastor of a Seattle-based megachurch being the latest to describe the Latter-day Saints as a cult, theologically.Simply said, by the theological definition, Mormonism is a cult,” wrote Pastor Mark Driscoll of Mars Hill Church on his blog Tuesday – the day author and speaker Chuck Colson told The Christian Post in an interview that Christians should not refrain from voting for someone because they are not a Christian. " 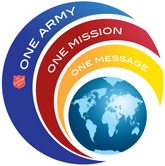 GENERAL Linda Bond made a passionate call for The Salvation Army around the world to be united in mission and message and to grasp new opportunities as she launched the International Vision: One Army, One Mission, One Message. The vision is given substance through 12 Mission Priorities – full details of which can be seen in the Vision Plan (http://sar.my/one). 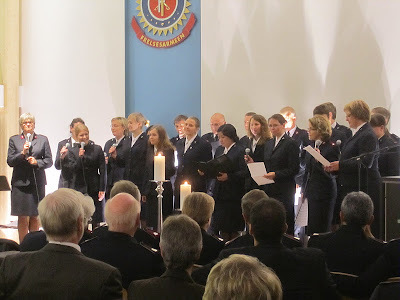 These priorities call on Salvationists to say 'we will' to principles such as deepening spiritual life; reaching and involving youth and children; and communicating Christ unashamedly. The General said she was aware that, if not approached practically, a vision could be 'only a pipe dream' but that the Mission Priorities make it clear that 'you have to do something'. 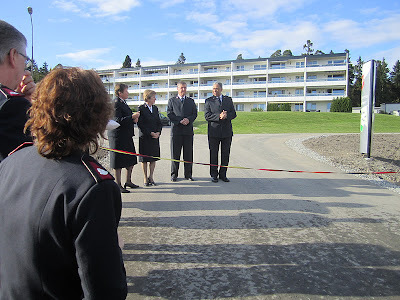 She emphasised that One Army, One Mission, One Message should not be seen as 'the General's vision' but that she wants Salvationists around the world – who she described as having 'the DNA of The Salvation Army tattooed on heads and hearts' – to say: 'This is our vision'. Launching the Vision Plan from The Salvation Army UK on Vimeo. 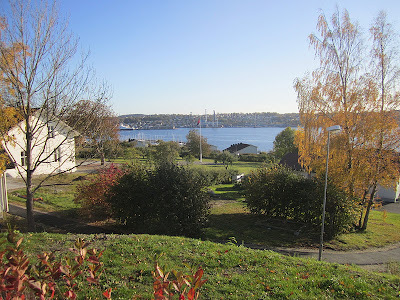 This weekend we spend at Jelöy, an island in Moss in Norway. 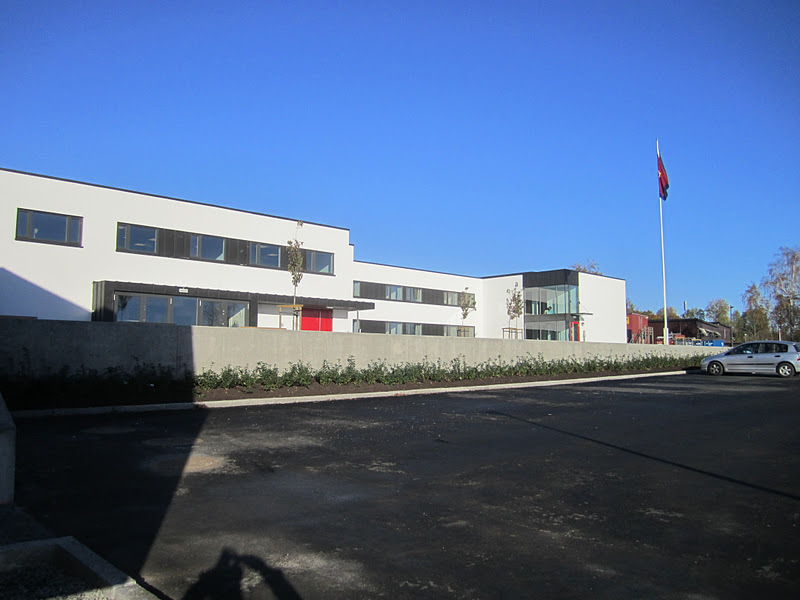 It is the opening of the new Conference Centre and the new corps building for Moss Corps. 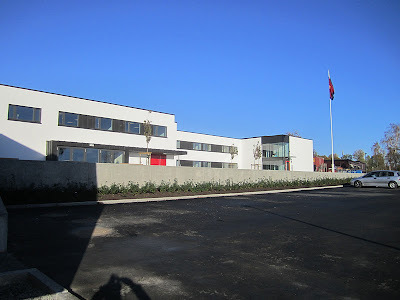 It all started Friday evening with a march from the old corps building in Moss to the new facilities on Jelöy. 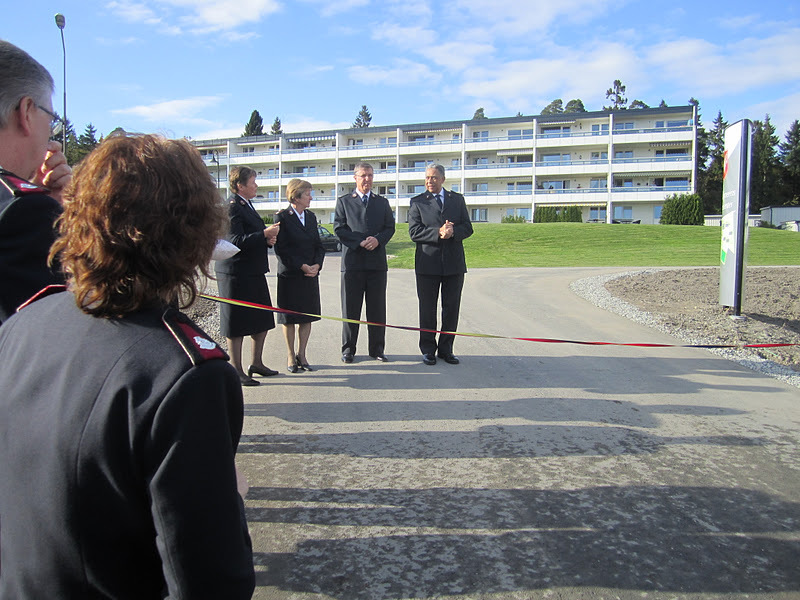 The Salvation Army has now gathered on the same site the School for Officers training, the Folk High School, the Conference Centre and the Corps Building. Friday was the corps day. Saturday was the special opening of the Conference Centre. Special guest was colonel Robert Street. 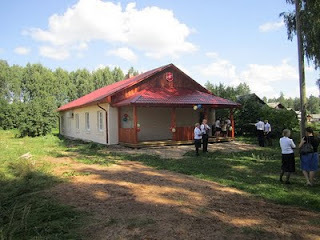 Now it is Sunday morning and soon time to go to the morning meeting in the new corps building. 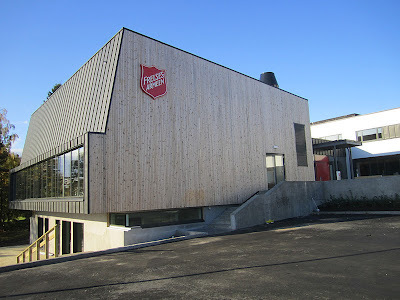 I believe the Salvation Army has a very unique commission. There are many denominations within the universal Christian church and we are all brothers and sisters. However siblings may not always be similar, either in appearance or personality. 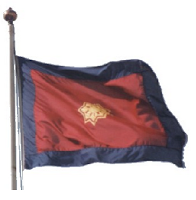 The Salvation Army's commission is to be an army that proffers salvation; a Salvation Army. Jesus said: "For God so loved the world that he gave his one and only Son, that whoever believes in him shall not perish but have eternal life. " (John 3:16 NIV). 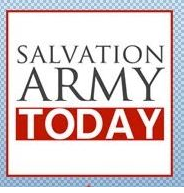 Jesus does not want anyone to perish, and so he raised up an army of people whose mandate is to save the people from being lost; a Salvation Army. I believe in the Salvation Army's mission! People who let themselves be seized by the vision of an army that marches steadily onward to save people. People who are not ashamed of what we are; marching boldly without fear in uniforms and flags and all the trappings that belong to an army. An army that does not try to imitate any of its siblings, but one that’s confident and daring in his own identity. An army that is not a poor imitation of some other church, but dare to be what it is commissioned to be. In the first section I wrote about the Salvationists’ uniform serving as a testimony that we believe in the common priesthood of all believers and that we do not draw a sharp distinction between professional clergy and regular, ordinary church members. Another reason to wear the SA uniform is to testify that; “I have entered into a covenant with the Lord”. The purpose is to enter more deeply into a tradition that has long existed within Christianity. Monks and nuns have historically aligned themselves into special orders identified by unique dress to testify that they have made the decision to resign from a nondescript lifestyle and enter into a covenant with God. Having accepted Jesus Christ as my Saviour and Lord, and desiring to fulfill my membership of His Church on earth as a soldier of The Salvation Army, I now by God's grace enter into a sacred covenant. I now call upon all present to witness that I enter into this covenant and sign these articles of war of my own free will, convinced that the love of Christ, who died and now lives to save me, requires from me this devotion of my life to His service for the salvation of the whole world; and therefore do here declare my full determination, by God's help, to be a true soldier of The Salvation Army." The vast majority of religious communities have some sort of priestly garb. They vary and can look very different one church to the next, but the notion that the priest has some form of distinguishing clothing has been with us since Old Testament times. In the larger denominations they even have uniquely decorated garments based on hierarchy; one’s status in the religious order. But the one commonality is that they have a need and intent to distinguish who is a ‘priest’ from those who are "regular" members. The Salvation Army is different. 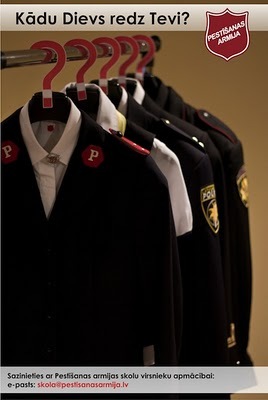 The uniform is a testimony that we believe in the common priesthood of all believers. All members / soldiers are active workers. In many religious communities one is considered an active member by attending church services regularly and listening to the priest or Pastor each Sunday. However, being a SA soldier in uniform testifies to the significance that I belong to and am in God’s service. It signifies that all members of Christ's body are functionally responsible and not simply passive spectators. Baptist Press - "Funeral services were held Oct. 10 in Cairo, Egypt, for some of the victims of a military attack against a group of Christian protestors that left 26 dead and hundreds wounded. In the wake of what could be the worst act of violence against Egyptian Christians in modern history, leaders of the Coptic Orthodox Church have called for three days of fasting and prayer for divine intervention, along with three days of mourning." EWTN - "Carlo Bellieni wrote a report for the Vatican's semi-official daily last week called "The Elimination of the Imperfect." "We note it by looking around us; we no longer see 'imperfect' children, marked by genetic diseases," observed Bellieni. "Censured by the media, sheltered by their families from a society that no longer accepts them (...) but above all aborted," these children "are systematically detected before being born and, once identified, they are often banned from being born." "What is grave," the doctor stated, "is that this screening and selection no longer surprises us: it's the norm." Baptist Press - "October is Pastor Appreciation Month. This is the month when many churches will take some time to show their appreciation to their pastor for his love and ministry over the past year. Some churches will take up a love offering for their pastor." What´s in the Bible? - "We live in an inclusive society. It’s more acceptable to be politically correct and to not make anyone feel uncomfortable, especially on matters of theology. Sometimes that makes it tough to be blatantly direct and unwavering in a fundamental truth. The thing is, truth is different than just a belief. Truth just… IS, whether or not one chooses to accept it. That’s how we Christians view the truth of our gift of salvation through Christ alone. 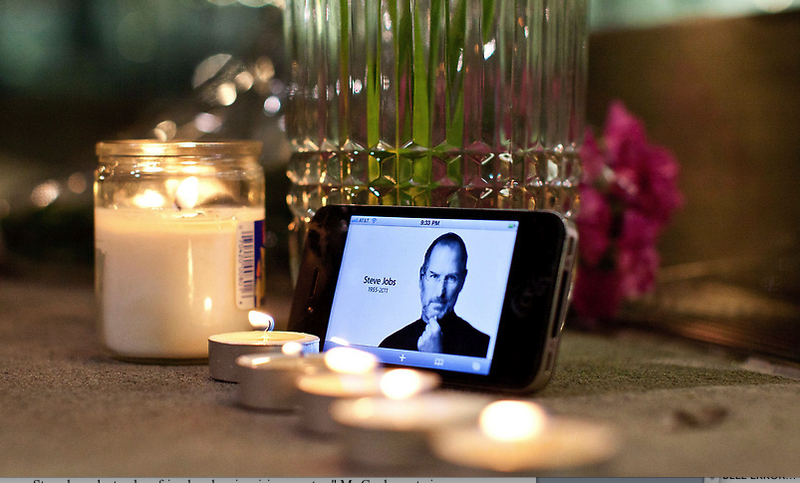 Steve Jobs, the visionary "geek" who changed the way the world looked at technology, has died. This is the news I woke up to this morning. The father of four started Apple Computer with high school friend Steve Wozniak in his garage in 1976 but was forced out a decade later. He returned in the mid-1990s and transformed Apple into one of the world's most powerful companies. Despite resigning as chief executive due to his health, Mr Jobs said he would continue to play a leadership role. 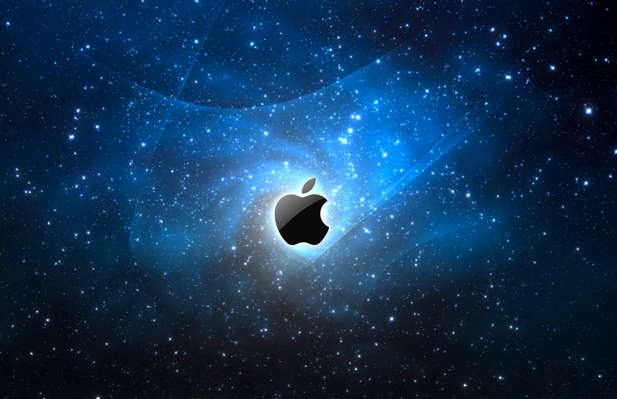 He was replaced by Apple's chief operating officer, Tim Cook, and took the role of Chairman of the company's board. The pioneering businessman, who was the mind behind the revolutionary iPhone and iPad devices, had been fighting pancreatic cancer and underwent a liver transplant in 2009. Apple's board said in a statement: "Steve's brilliance, passion and energy were the source of countless innovations that enrich and improve all of our lives. The world is immeasurably better because of Steve." "Those of us who have been fortunate enough to know and work with Steve have lost a dear friend and an inspiring mentor," Mr Cook wrote in an email to Apple's employees. 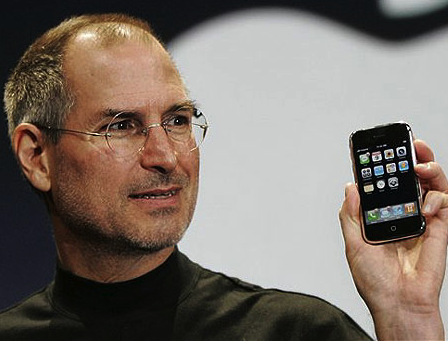 "Steve leaves behind a company that only he could have built and his spirit will forever be the foundation of Apple." The news Apple fans and shareholders had been dreading came the day after Apple unveiled its latest iPhone, a device that got a lukewarm reception. Perhaps, there would have been more excitement had Mr Jobs been well enough to show it off with his trademark theatrics. A statement released by Mr Jobs' family said: "In his public life, Steve was known as a visionary; in his private life, he cherished his family. We are thankful to the many people who have shared their wishes and prayers during the last year of Steve's illness." What a man … what amazing tributes to one individual. Reading these comments made me think of a phrase I often quote when conducting funeral services and I found myself praying it again today in response to a man I have never met, but in response to a man whose life has touched and influenced mine as I sit here typing on my Apple Mac laptop. Who of us wouldn’t want to hear said of us at the end of our earthly lives: "Glad's brilliance, passion and energy were the source of countless innovations that enriched and improved all of our lives. The world is immeasurably better because of Glad." "Those of us who have been fortunate enough to know and work with Glad have lost a dear friend and an inspiring mentor,"
Rick Warren at the beginning of his book: ‘Purpose Driven Life’ asks the question: ‘What on earth am I here for?’ … life’s most important question. Answer that question he says and you will understand the ‘big picture’ how all the various pieces of our lives fit together. Our true value, our great worth, our high calling is emphasised in Ephesians 2: 10 we are: ‘God’s workmanship, created in Christ Jesus to do good works’. In his sermon, ‘The Drum Major Instinct’ Martin Luther King Jr asked not to be remembered for his Nobel Peace Prize, his numerous awards or where he went to school. He asked rather to be remembered as someone who ‘tried to love and serve humanity’. Our names may never be famous, it is very unlikely for most of us that we will be world renowned and on the day of our death it is very doubtful that such breaking news will hit the world press as has Steve Jobs’. But, may his dying challenge our living and may we be reminded of the high calling that is ours and the purpose for which we were created. A busy week is coming close to it´s end. Monday we had a visit from the board of the Baltic Children Foundation. They have supported our "Change a village"- project in Sarkani. They came with a private jet to the airport in Riga to see the Children´s House for the first time. The corps leaders and the cadet, doing field practice as children worker in the village, told about the project and the board members were touched almost to tears. 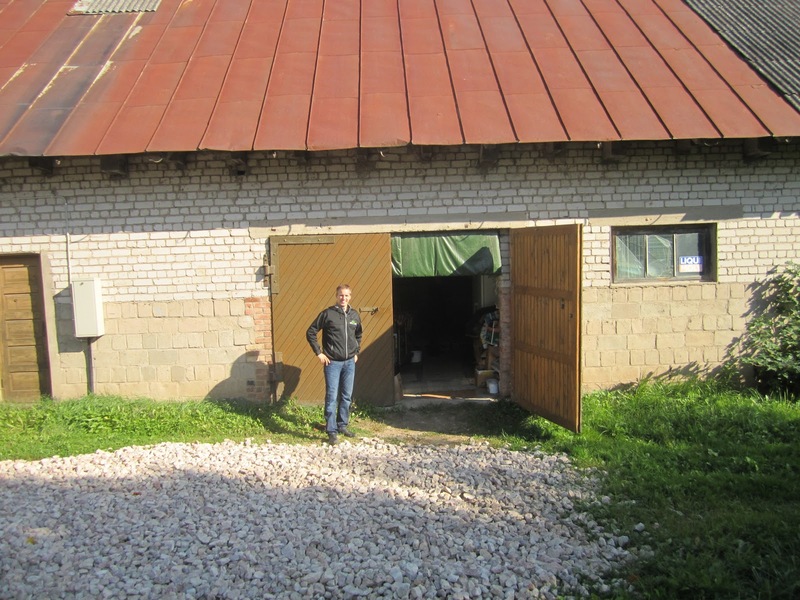 Here you can see the house when we bought it and after one year. 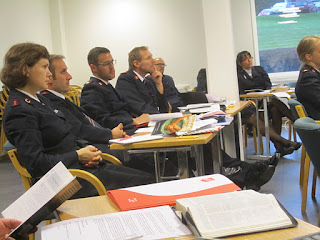 Tuesday Ruth and I taught an Officer´s course on Discipleship and Wednesday we had a board meeting at Skangal. Thursday we had a meeting with our Strategy Board looking at the reports from the Leaders Vision Day about the Salvation Army in Latvia in five years. Really encouraging reports. Friday we had a Spiritual Day at the School for Officers training. Our guests this time were the Chief Secretary Johnny Kleman and the Program Secretary Eva Kleman. Their theme was "Do not loose heart". 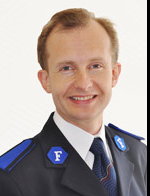 Now it is Sunday morning and we will have a board meeting with the Leadership for the Sweden/Latvian territory in the morning 9 o´clock. The reason for the very unusual time for a board meeting is that Ruth is leaving for Prague later today to take part in a reference group preparing the European Congress in October 2012. After the Board Meeting the Board will take part in the Sunday morning service at Riga 1 and then visit different Salvation Army operations in Latvia during Sunday and Monday. And by then we are already in the new week. I hope it will be a blessed week for you. Haaretz.com - "More than a million people have visited a new website featuring high-resolution photographs of several Dead Sea Scrolls since the site was launched less than a week ago by the Israel Museum and Google Israel." Christian Post - "Should religious institutions have to follow anti-discrimination laws? That’s the question the Supreme Court will address on Oct. 5, when one of the most important religion cases in decades will be presented. The case concerns “ministerial exception,” a 40-year-old legal doctrine that protects churches and other religious institutions from government interference in their employment decisions." Mission Network News - "Two thousand years ago, Jesus told His disciples that there will be a day when "this Gospel of the kingdom will be preached in the whole world as a testimony to all nations, and then the end will come" (Matt. 24:14, NIV). "It must have been staggering [to the disciples]," notes evangelist Ron Hutchcraft. "But today, with the internet, with technologies--whether it is Twitter, or whether it is search engines on the internet, whether it is Facebook or social media--we're talking about the vehicle for actually having that happen. Literally, it would be possible for everybody to hear now, because technology reaches every corner of this planet." Joyece Meyer - "Indecision is a miserable state to be in and certainly is not a fruit of the simple life. Simplicity prays, seeks wisdom and decides. It doesn’t waffle. It sticks with the decision it made unless there is a very good reason to change it. The apostle James said the double-minded man is unstable in all his ways and will not receive anything he asks from the Lord. How can God give us anything if we can never make up our minds concerning what we want?" Another intense week is coming close to its end. We had a great time at the Leader´s days in Daugavpils Tuesday and Wednesday. It was good to meet with all leaders again. 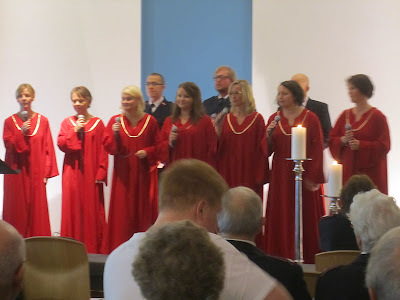 Last time we all met was at the Congress in Stockholm in July. Ruth spoke about visionary leadership and the leaders were given time to dream, pray and think about their visions for the future. How will The Salvation Army in Latvia look in five years? I look forward to read all the reports. The next day we had a meeting with our Advisory Board. 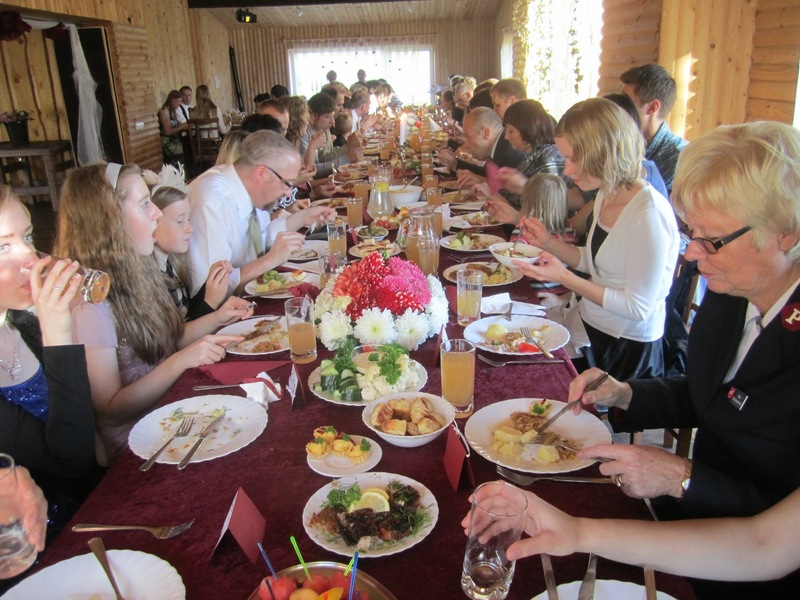 It is a group of prominent people from different sectors of the society meeting to give advice to The Salvation Army and help us to get the Army known in Latvia. In the board we have an ambassador, a lawyer, a politician, a journalist, a person from the academic world and several business leaders. It is a great group of people. Friday we had visitors from TSA second hand shop in Lidköping and from TSA humanitarian aid in Västerås. 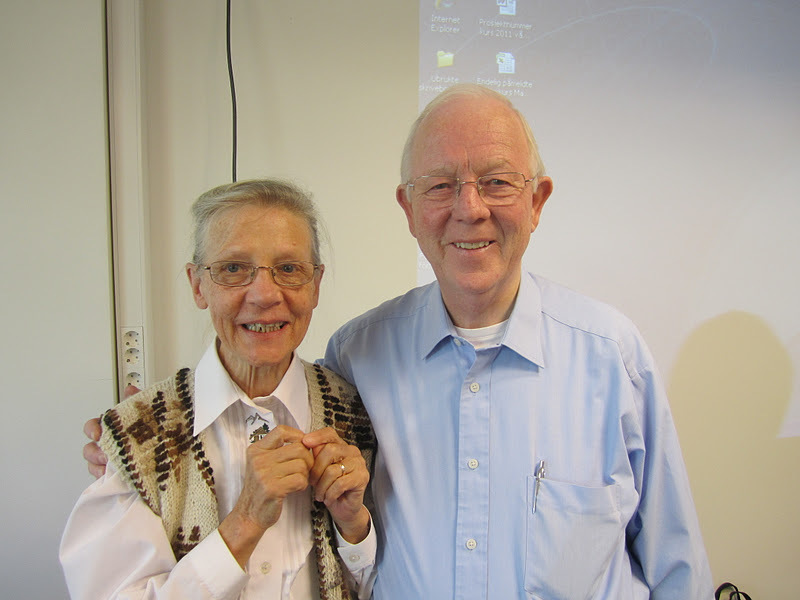 They are both contributing to our work in Latvia. 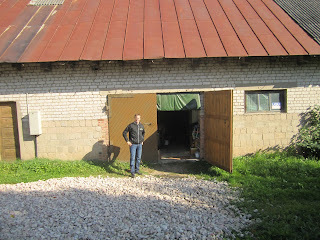 We also took time to go down to Bauska and look at their storage barn. 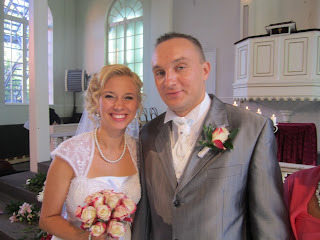 Saturday we drove the three hours to Liepaja on the West Coast to attend the wedding of Olesja and Uldis. Olesja used to be our personal secretary and translator our fists year in Latvia. Now it is Sunday morningn and soon time to go down to the Sunday morning meeting at Riga 1st corps. Have a blessed week!